Watershed is an area that drains its total runoff through a common outlet. Watershed Management has a prime objective of Conservation of Existing natural resources in a given watershed. Global warming & Climate change is becoming an international threat to all watersheds on this earth. In Indian perspective, 60% of the agricultural land comes under rainfed area. This is a great challenge as more than 50% of land areas cropped under agricultural crops is not having access to assured irrigation for the crops. With Global warming and climate change issues, the conditions are further becoming pathetic. In rainfed conditions 3-4 months i.e. June to Sept are crucial for rainfed crops. The rain fall becomes erratic, irregular and intensive with climate change. As a result, crops are worst affected. Intensive rainfall results in flooding of the area followed by soil erosion with gushing flow of water acting as the major erosive agent. The erosion of fertile top soil from agriculture land limits the agricultural crop production. On other hand, rise in temperature as an effect of warming and climate change makes the soil dry. The available water in the soil gets reduced and Water holding capacity of the soil gets decreased. Soils with low water holding capacity (WHC) results in low productivity of crops. This result in reduction in Land use efficiency also gets reduced. 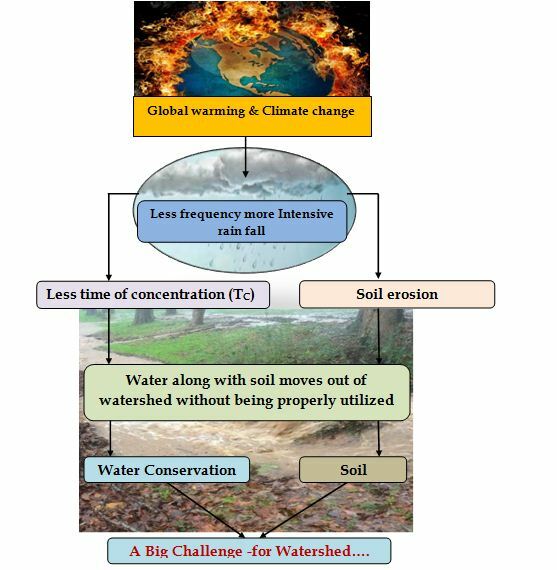 As an effect of Global warming and climate change, the soil along with water moves out of Watershed area without being properly utilized. Hence Conservation of soil and Water is under threat. That’s certainly is a big challenge in way for Watershed Management .